Fireworks begin at dusk. Great viewing spot from Wilmer Park! 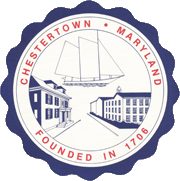 In Case of Rain... Chestertown’s July 4th Fireworks are launched as soon as possible after dusk, usually between 9 and 9:15 p.m.. There is no rain-date policy. In case of heavy rain and/or lightning at the 9 o’clock start time, the fireworks will be delayed just until there is a break in the evening's weather. 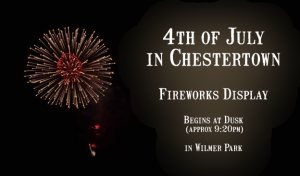 Wilmer Park offers great views of the show.